Ensuring the safety of children who ride bikes may not be possible 100 percent of the time, but taking certain measures can greatly increase their chances of remaining injury-free. Bicycle safety is important because, according to the CDC, the risk of being injured in a crash is greater for bicyclists than it is for people in cars and other motor vehicles. When it comes to children, the risk of injury from a bicycle-related crash is highest between the ages of 5 and 14 years old. The CDC also notes that these injuries make up as much as 60 percent of injuries that come into emergency rooms. Whether teaching young children to ride or dealing with an older child, it is important for parents and guardians to ensure that their children are biking as safely as possible. They can do this by giving them the tools and the knowledge necessary for bike safety. Whenever children go bicycle-riding, they are at risk of falls or collisions. These types of accidents can potentially cause serious injury, particularly to the head. A head injury can result in numerous severe problems, ranging from headaches to learning disabilities, and may even result in death. Parents can help prevent bike-related head injuries by gearing their children with properly fitted bicycle helmets. In certain states, there are laws that require the use of a helmet when riding a bicycle; however, even in areas that have no such ordinance, parents should consider the safety of their children first and foremost and consider providing them with a helmet to wear. Helmets are available at most bike shops and other bike retailers. When buying a helmet, parents will want to check for a sticker that indicates that it meets the U.S. Consumer Product Safety Commission (CPSC) standard. This sticker is typically located inside of the helmet and is easy to find. Once this has been established, parents will need to have their children try on the helmet for fit. When trying on helmets, they will need to be placed on the child's head correctly. That means setting it on the top portion of the child's head in a way that it is not tipped forward, backward, or to either side. A parent should be able to place two fingers' width between the helmet and the child's eyes when determining if it is placed properly. Next, secure the chin strap firmly beneath the chin to keep the helmet in place. When positioned properly, the straps beneath each of the child's ears will look similar to the letter "Y." If the child's mouth cannot open and close without discomfort once the strap has been buckled in place, the strap is likely too tight. When the child's head moves, the helmet should not move with it, as this indicates the fit is too loose. If it's too loose while the child is biking and in motion, the helmet may move, block the vision, or fail to properly protect the head. Also, when buying a helmet, look it over for any dents or severe scratches that may indicate that it has been previously damaged. This is important when buying a secondhand helmet. A helmet that has been damaged in an accident such as a fall or collision can no longer provide the proper amount of protection that is necessary for any potential future accidents. A properly fit and well-maintained bicycle is crucial for the safety of every child who rides a bike. This requires thoughtful consideration when buying the bike and ongoing care and maintenance. When buying a bike, parents will want their children to both sit on it and straddle it. When straddling the bicycle, they should be able to plant their feet flat on the ground. Once seated, the child's feet should no longer be able to rest flat, although the balls of the feet should touch the ground. Also while seated, have the child reach for the handlebars. If they cannot be reached without stretching, the bike is too large. Choosing a bike that fits the child's current size is important versus choosing a bike that will fit later as the child ages. 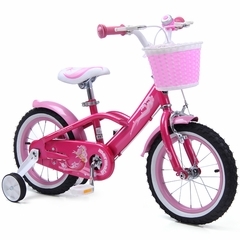 While buying a larger bike might seem like a way to save money as the child grows, a bicycle that is too large can be difficult to control, affect the child's confidence when riding, and even cause an accident. Parents will also want to check their children's bikes frequently to ensure that they are safe and in good working condition. The chains should be cleaned and lubricated regularly and any loosening bolts tightened. Tires should also be checked prior to each ride to ensure that the pressure is correct. Parents will also want to verify that the brakes are working correctly before each ride. Necessary equipment includes bike locks, a headlight and taillight, a mini air pump for tires, and even a cage to hold a water bottle. In addition to helmets, it is important for kids to have the right gear when they hit the road on their bicycles. Proper gear includes wearing the right clothing and shoes and even gloves. In addition, the right gear helps keep kids comfortable as well as prevents accidents and injury. Dress kids in clothing that is brightly colored or fluorescent to increase their visibility to other vehicles and people on the road. Opt for clothing that is comfortable and that fits the child properly. Clothing that is too tight can be overly restrictive, while loose clothing may catch in the bike while riding. Knee and elbow pads are helpful to prevent scraped skin if falls should occur. Whenever possible, long sleeves and pants should also be worn. To protect the palms, parents may consider having their children wear gloves. Reflective tape can be worn on shoes and/or jackets to improve visibility. It is acceptable to wear regular shoes provided they are sized properly, have a closed toe, and grip the pedals. Kids shouldn't wear shoes that can get caught on the pedal or that can fall off, such as flip-flops or cleats. Both the time of day and the weather will have an effect on safety while on the road. A high percentage of bicycle accidents occur at night, and younger kids should not be allowed to ride their bikes at night or at dusk, particularly in areas of low light and visibility. Daytime, during clear weather conditions, is the ideal time for riding a bike. Depending on the age of the child, parents may want to limit or prohibit kids from riding during rainy or foggy weather or in freezing conditions when there may be ice, black ice, or the risk of snow. Poor weather conditions affect how well the bicycle brakes and can affect the child's vision. Children are faced with a plethora of road hazards when riding their bikes. Cars on the road are an obvious hazard that children must be aware of, but they must also be taught to exercise caution around cars that are parked, backing out of driveways, and pulling out of parking lots or spaces. Potholes are another hazard that may cause a child to crash, as can uneven terrain, raised tree roots, and debris. Children should also be cautious of or avoid riding near or on railroad tracks. Kids young enough to ride on the sidewalk must be cognizant of uneven sidewalks or cracks. Ensure that kids understand what the rules of the road are and that they follow them each and every time that they ride their bicycles. One of the best ways to do this is for parents to lead by example and always follow the rules themselves. One of the top rules is to obey all traffic signs, lane markings and rules, and signals. Teach children to never ride against traffic but to go with the flow of it. Know the rules regarding age and riding on the sidewalk and ensure that children follow them closely. Sidewalk rules are often age-related and vary from one location to another. Kids should never make unpredictable moves when riding near cars or in busy areas. Bicyclists should always check for oncoming traffic and use verbal and hand signals to announce moves.